TDT Plumbing is a trusted leader in Multifamily Commercial Pipe Repair. Deteriorated pipes, whether for potable water, (Copper, Galvanized Steel, etc. ), for Sanitary Sewer use (Cast Iron, PVC, Concrete, or Clay) or other piping systems like natural gas, condenser water, chilled water or heating water systems can cause expensive damage to your tenants and property owners. 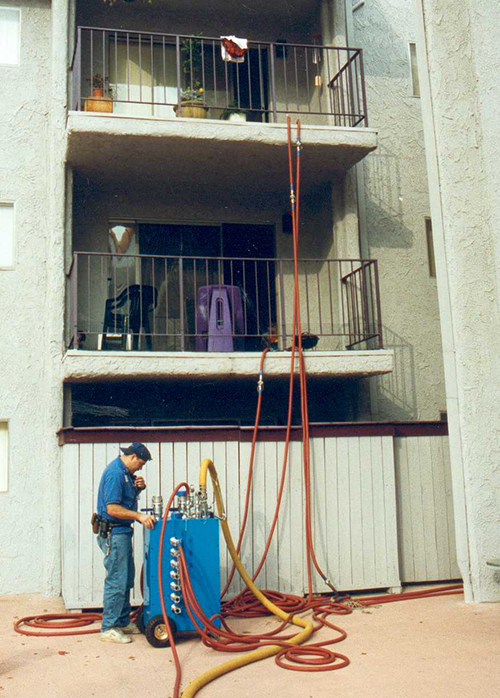 Whether it’s a duplex, apartment building, or even a high-rise or commercial building, you know those hard to find pinhole leaks, corroded air conditioning drainpipes, or broken pipes exist, now TDT makes Multifamily Commercial Pipe Repair more convenient for tenants and owners with in-place pipe repair. Generally, the older plumbing system, the greater the benefit of TDT Plumbing in-place pipe repair. If a building is 25 years old, the amount of deferred maintenance, including replacement with more modern fixtures and piping, has likely grown to the point where operational costs are higher than the repair cost. TDT Plumbing provides Multifamily Commercial Pipe Repair project management, pipe location, pipe investigation, testing, cleaning and safe, economical, and non-disruptive pipe restoration and pipe repair of building plumbing systems. We restore pipes within the walls and under slab, without tearing them out, as would be the case with repiping. Homeowners, the US Military, hospitals, universities, major hotels, resort facilities, apartments and industrial facilities have already benefitted from TDT Plumbing’s revolutionary pipe restoration and pipe repair technology. Read stories and reviews from satisfied TDT customers. Before conducting plumbing repairs, TDT Plumbing thoroughly analyzes your system. We look at any problem with an analytical eye, to recommend the most effective solution for the Multifamily Commercial Pipe Repair from duplexes and apartment buildings to high-rise buildings. No Multifamily & Commercial pipe repair job is too big or too small for TDT Plumbing. Our pipe repair specialists are equipped to handle small tenant improvement projects to full facility design and restoration. Call (713) 697-2088 now. Or, fill this out. A TDT Plumbing multifamily and commercial pipe repair expert will follow up to learn more about your issue and schedule an evaluation.